On October 20th and 21st, MasterVoices (formerly The Collegiate Chorale) brought 27, an opera by RICKY IAN GORDON and ROYCE VAVREK, to New York City for the first time. The “clever, witty libretto” [Saint Louis Post-Dispatch] of 27 celebrates the life of Gertrude Stein and the legendary salons she hosted at 27 rue de Fleurus in Paris. The opera draws the audience into the artistic environment that Stein created and shared with many important artists of the twentieth century including Pablo Picasso, Henri Matisse, Man Ray, Ernest Hemingway and F. Scott Fitzgerald. At its core, it is a portrait of a genius and her legacy as knitted to life by Alice B. Toklas, her wife. Soloists Stephanie Blythe, Heidi Stober, Theo Lebow, Tobias Greenhalgh, and Daniel Brevik, were accompanied by the 150 singers of MasterVoices and the Orchestra of St. Luke’s (directed by James Robinson and conducted by Ted Sperling). The production was a hit with the New York audiences — find some of the reviews below. 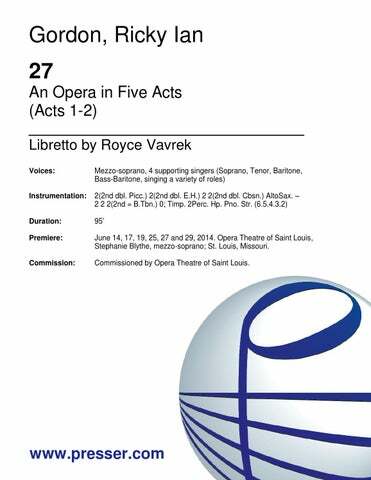 27 is a triumph for Gordon and Vavrek and a tour-de-force for all of the performers. Instr: 2 2 2 2 AltoSax. – 2 2 2 0; Timp. 2Perc. Hp. Pno. Str. This entry was posted in Opera News and tagged 27, opera, Ricky Ian Gordon on October 26, 2016 by nball. This entry was posted in Premiere Info - Past, Premieres and tagged 27, opera, Ricky Ian Gordon on August 17, 2016 by nball.